In most parts of the tropical world, this tree is a beautiful and unassuming addition to landscapes in parks and in conservatories, as well as home gardens. Cultivated for container use, it has also happily made its way around the world in the ground. Even though its origin is in Asia, it has naturalized in many other parts of the world, including the southern US (Florida’s wetlands where it’s slightly invasive), Hawaii, Bermuda, Puerto Rico, the Dominican Republic, and in South Africa. It’s also found a happy home in Micronesia and other tropical parts of the world. It’s a staple tree in these areas and has been for a long time. Reaching heights of about 15 metres and when young having an equal spread, this slightly stout palm suits landscape needs well as it’s not too tall, not too thin, not too short, and not too wide. It grows well under taller palms and looks nice behind shorter plants. It can also make a great specimen and anchor in smaller gardens where it’s still allowed to spread out. 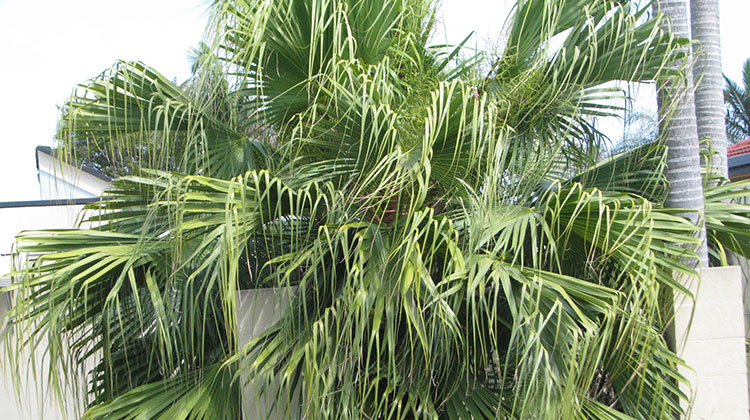 Fairly neat and tidy, this large-leaved palm is a very welcome addition as a basic bones element in any tropical garden. This palm naturally grows as a single, naked trunk, and should be encouraged to grow as such. 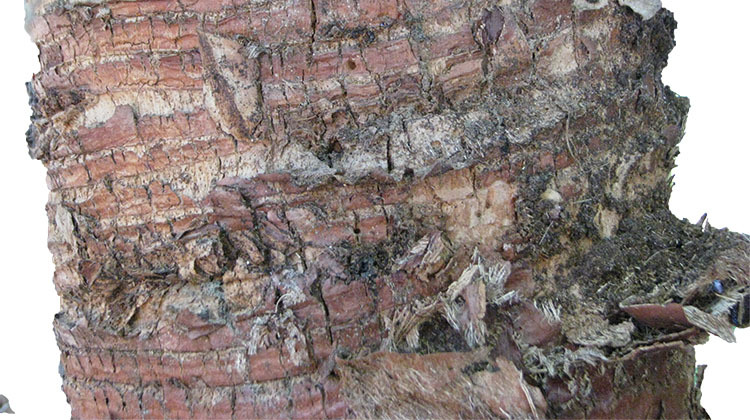 The bark is showy with lots of texture. Even if a specimen naturally doesn’t want to grow a central leader, it’s easy to prune early on and doesn’t require a lot of training or encouragement. The Chinese fan palm sports very inconspicuous and not very showy white flowers all through the warm season. Each green leaf is palmately compound in shape and usually about a meter in length. They droop at the end of the blade in a showy fashion. The petioles (leaf stems) fan out from the base and there’s usually one leaf on each petiole. It is self-cleaning so requires little or no pruning. The fruit is round with a fleshy covering and ripens to a black or blue color. The fruits aren’t especially attractive to animals but they also don’t make a mess. They are fairly inert and harmless. 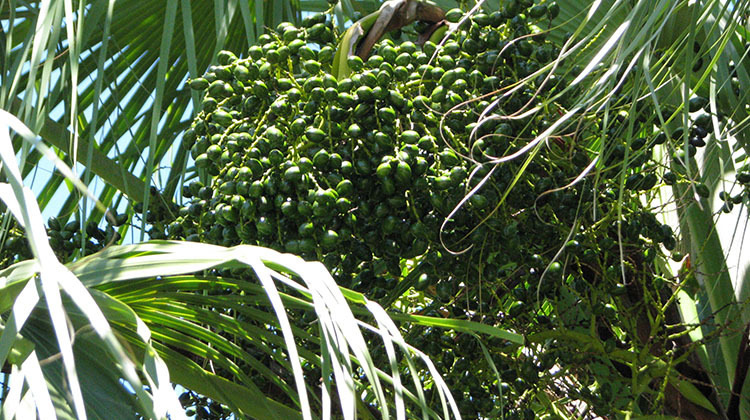 As with most palms, propagation by seed is recommended. Plant fresh seed in good (preferably palm) potting mix and keep warm and moist. Germination can be from a few days to a couple of months. This is a palm that enjoys and does better with some shade, and not full sun. 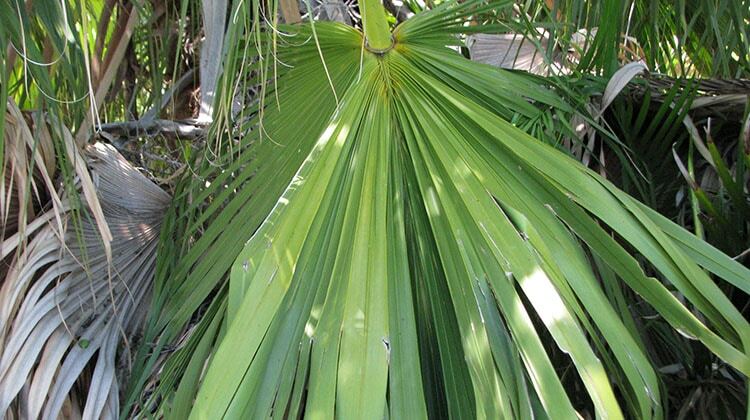 This makes it an ideal understory palm, or a palm for a less than sunny side of the house or in a shady corner. They do well in areas where they don’t have to spread roots, and do fine in confinement. They aren’t generally destructive to buildings and concrete surfaces. While they may not be especially tolerant to salt spray, they do fine in urban settings where they’re protected from ocean and prevailing strong winds. They are fairly clean trees and don’t really need a lot of pruning or training. 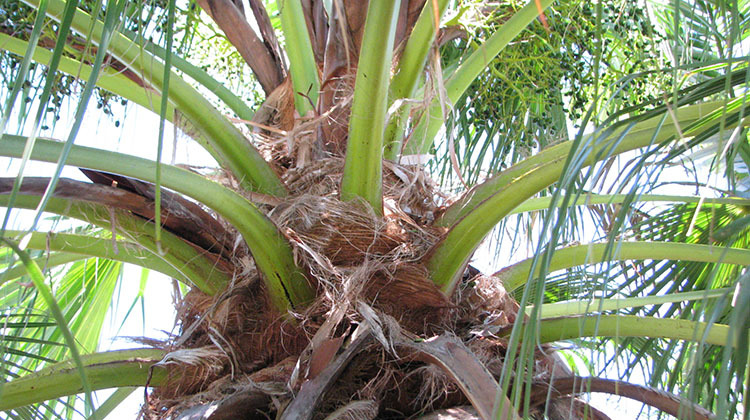 This palm does require more feeding than many others, and enjoys a feeding or two regularly throughout the year. They benefit from organic mulch and compost in their initial planting hole to help it off to a good start when young. Keep evenly watered but don’t overwater, as this palm needs good drainage but constant moisture. This tree is ideal for a protected spot among buildings or under taller trees. Lots of people confuse fan palms, and it’s not surprising: the name is used for many different species and even different genera. 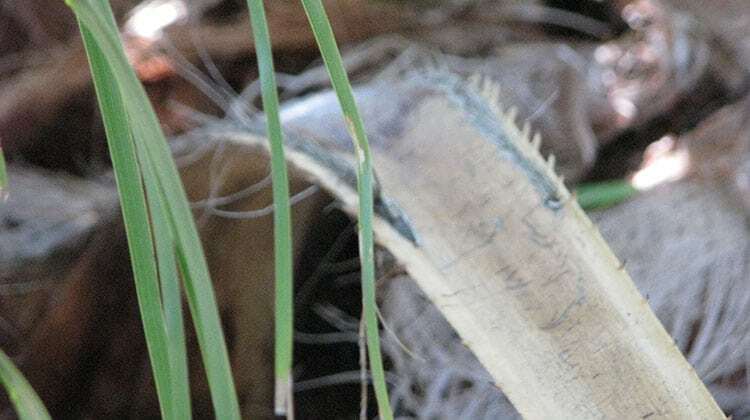 Below is a photo of a Chinese fan palm showing the base of the petioles. Notice they aren’t split where they attach to the crown shaft. This is always the case with Livistonas, while palms in the Washingtonia genus the rachises are always split near the shaft. 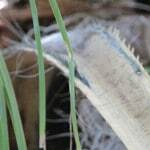 In the following photograph, note the serrations on the base of the petioles (near the sheath). This is another distinctive feature of all Livistonas that Washingtonias lack. I live in ashgrove and have a passion for palms. Originally from New York city so the sub tropics of brizzy fascinate me. Have a garden with about 20 different species and ypur info on the Chinese fan palm was helpful.